Everybody is given the same 24 hours in a day. Today I spent four of those hours walking, running, sometimes limping with the Rick Hansen 25th Anniversary Relay. He has done more in one short lifetime than generations of people have done in many. Not only has he raised millions and millions of dollars for spinal cord research, he has championed accessibility around the globe. Everybody is given the same 24 hours in a day. Today I spent four of those hours walking, running, sometimes limping with the Rick Hansen 25th Anniversary Relay. The relay celebrates the 25th anniversary of the Man In Motion World Tour while also bringing together 7,000 individuals in this country who have done something to contribute to their communities. These are people like Jeneece Edroff who has raised millions of dollars to build Jeneece Place where sick children and their families can go. I handed off to a woman from the Squamish First Nation; she ran with an eagle feather in her hand and a small photograph of her son, Frank, who had died from complications of a spinal cord injury. She was grateful to the creator and for the Blusson Spinal Cord Centre which gave her son and his family 18 months together. I walked with George Cohon, founder of McDonald's in Canada and a huge lifelong supporter of Rick Hansen and his dream. I ran Olympics next to a woman whose name I never got as she wheeled determinedly up and down hills of downtown Vancouver, not losing her focus for one moment. You couldn't help but focus on her ability, not her disability. And this is one of many things Rick Hansen has taught us -- to see how connected we all are, to see whatever the disability that people have, we still have the same kind of hopes and dreams for our lives. Everybody deserves to access these opportunities. The difference between sitting in a wheelchair and walking freely down a busy street is as quick as a blink of an eye; the difference between us and any countless circumstances is one gene, one chromosome, one split second in time. 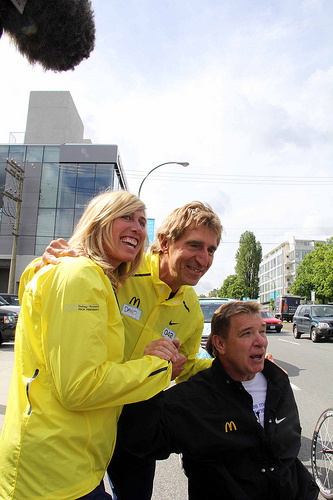 Rick Hansen has inspired me personally in so many ways. He is a hero. Sometimes I think he is a saint. He has done more in one short lifetime than generations of people have done in many. Not only has he raised millions and millions of dollars for spinal cord research, he has championed accessibility around the globe; he has changed peoples minds. 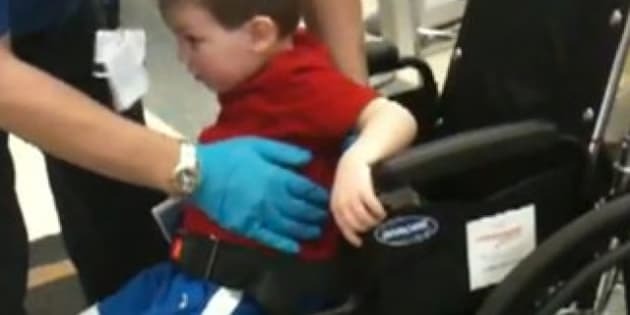 He has changed the way we see people in wheelchairs. All over the world there have been ramps that have been built, schools that have been opened and people given the opportunity to live full and productive lives. This thinking has been changed because of Rick's example, his fearlessness in the areas of accessibility and opportunity for people with spinal cord injuries. Rick will be the first to remind you that he did not do this alone, he did this with others. He credits his team for the phenomenal achievements that have been made to these last 25 years. The leader has been Rick Hansen. So you have to forgive me if part of me wants to see this man sainted. But at the same time I know better than that. To move him into the category of saint would make him better than us. And that lets us off the hook. Ultimately, Rick in all his inspiration, goodness and hard-edged determination is just a man. If he is going to inspire us, and he will, it's because we connect to him as a human being. Watching Rick we can't help but ask ourselves -- if this is what Rick can do with his life what can I do with mine?